(CNN) -- A student opened fire Friday inside a suburban Denver high school, injuring at least two people before turning the gun on himself, authorities said. 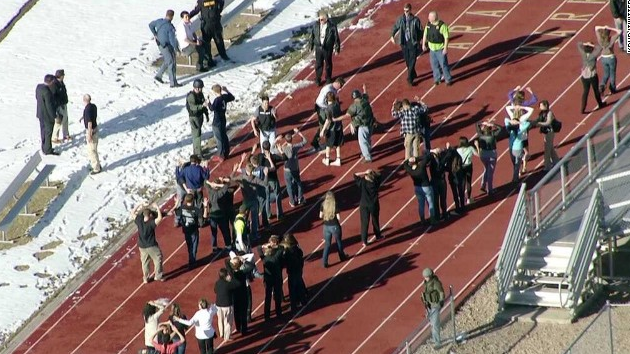 The shooting began after the student entered Arapahoe High School in Centennial with the intention of confronting a teacher, Sheriff Grayson Robinson told reporter. He declined to identify the dead gunmen. At least one person -- a minor -- was taken to Littleton Adventist Hospital with a gunshot wound, Lauren Brendel, a hospital spokeswoman, told CNN. Brendel did not release the age, gender and condition of the minor. But Robinson told reporters that two students were shot, including one who was taken to an area hospital in serious condition. "We have not been able to locate a second suspect, but that's part of our ongoing investigation," the sheriff said. Authorities descended on the school after news of the shooting broke -- on the eve of the one year anniversary of the massacre at Sandy Hook Elementary School in Newton, Connecticut. The shooting also occurred roughly 10 miles from Littleton, where Eric Harris and Dylan Klebold killed 12 students and one teacher in a rampage at Columbine High School in April 1999. The first sheriff's deputies and police officers arrived at Arapahoe and entered almost immediately after the shooting was reported, Robinson said. Within about 14 minutes of the initial report, "we had information on the radio that my deputies believed they had the shooter down inside the school," Robinson said. Dozens of children could be seen walking away from the school, with their hands in the air. Some stood in lines at what appeared the high school track field, where they appeared to be undergoing police pat-downs.